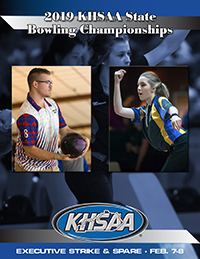 Instructions for the KHSAA State Bowling Championships are now posted on the KHSAA website. The oil patterns selected for the state competition can also be found through a link within the instructions as well as on the KHSAA Bowling page. Lane assignments will be posted once all regional competitions are complete and state qualifiers are determined. Please contact Assistant Commissioner Sarah Bridenbaugh (sbridenbaugh@khsaa.org) should you have any questions.